These are my new winter boots. They just arrived today, and I'm in love with them. I finally retired my old pair last year, after nearly eight years. As a result, I had been looking at boots for weeks, lusting after some of the tall, industrial-looking Sorel and Timberland boots, but here in the west of Scotland, we get very little snow, so for my needs, that type or arrangement would be a little OTT. Not that you don't see people wearing them, but its just not really what you need here. My boots basically just need to get me over a dusting of snow with the occasional snowstorm thrown in, and to get me from the car to the ski lift and through the village when we go on ski holidays. And they have to be really waterproof. This is Scotland, after all. But that's basically it. So my rule for shopping for my new pair was that if something looks like it would fit an outfit that featured a length of rope, an ice axe, and maybe a St. Bernard, it's probably OTT, and would look silly, no matter how cool I thought they were. That approach served me well, because I ended up with this pair of Hi-Tec Talia snow boots. 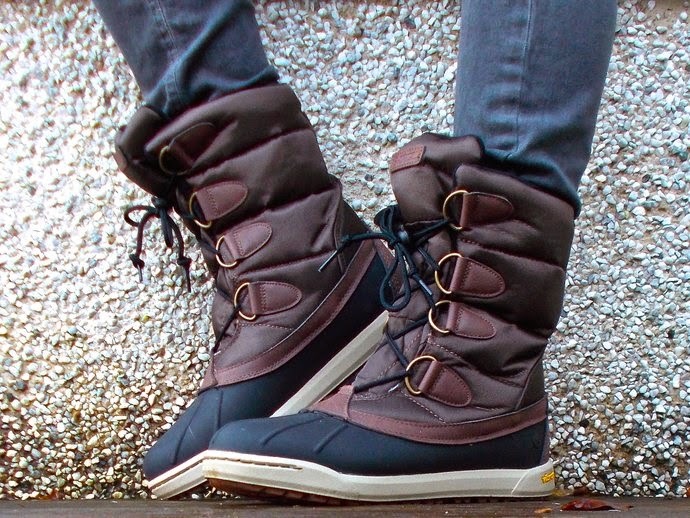 These boots are part snow boot, part duck shoe, and part sneaker. Perfect, and a great deal too, I might add. Looking for boots? I already know the answer to that if you live in Wisconsin, Minnesota, or anywhere along the eastern seaboard up until about the Carolinas (hey, I watch the news). Here are a few cool picks for you, from lightweight "barely snows here" boots up to the mother lode. I just bought my very first pair of snow boots since like the 3rd grade. They are Sorels and they're super cute and hopefully they'll keep me warm when it finally snows here in Pittsburgh. So far it's just been really, really cold, but no snow.